This events guide features all the information we have on events in Chicago. 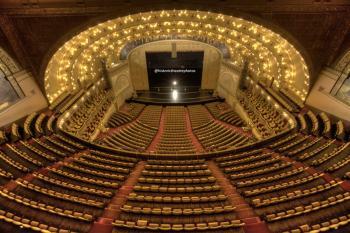 The guide covers theatres featured on this website so you may wish to check local listings for any additional theatre tours available in Chicago. Enjoy your event! The general tour schedule is: Mondays: 10:30am and Noon, Tuesdays: 5:30pm, Thursdays: 10:30am, however this is subject to change. Check the event website for the latest schedule. Tour: $12 per person; Tour + Water or Soda: $15 per person; Tour + Beer or Wine: $20 per person (Tuesdays only). Go on a history-filled journey, from the inception of this majestic venue in 1921, all the way to its present-day incarnation as a premiere entertainment venue. The Marquee Tour encompasses historical and architectural highlights of the building, including the grand lobby, sweeping staircase and majestic auditorium. Tour guests have the chance to stand on the famous Chicago Theatre stage, plus view artist signatures on the dressing room walls, including Frank Sinatra, Dean Martin, Dolly Parton and so many more! Tours run daily at 12pm and are one hour long. Ticket Prices: Adults: $15, Students and Military: $13, Children (12 & under): $10. Groups (10+): For more information on group tickets, call (312) 462-6332. Tour content, prices, dates, and times are subject to change without notice. Tours are offered on a first come, first served basis and are subject to availability. 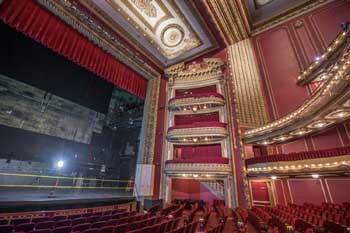 Broadway In Chicago offers a public tour of our theatres every Saturday at 11am. Each tour visits two of our three theatres: the Oriental Theatre, the Cadillac Palace and the CIBC Theatre. The tour showcases the glittering vintage décor inspired by the foremost theatre designers of our time, who created through their designs in the French Renaissance styling. You will also learn about the cutting edge technology that makes each theatre the home to today’s most complex theatrical productions and the recent restorations that brought beauty and elegance back to these century-old theatres.